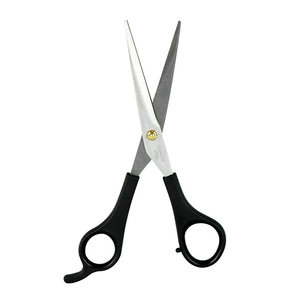 Hair Scissors (PLF-50AS) 1. Hardness Rockwell (HRC) value at 59. 2. 440c (Japanese stainless steel) with vacuum heat-treated 3. Perfect for slide cutting 4. Offset handles 5. Removable finger rest 6. Coin = adjustable screw 7. 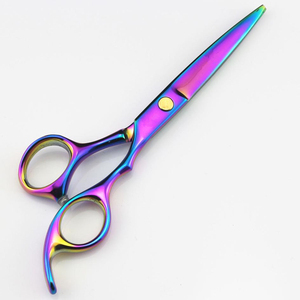 Lightweight scissor 8. Slim design 9. Size:5.0"
On request we supply instruments personalized with your logo or company name (minimum 100 pcs. Our valued buyers always appreciate our quality, workmanship and on time deliveries. To judge our quality, sincerely suggest to please let us have trial requirements. 5. 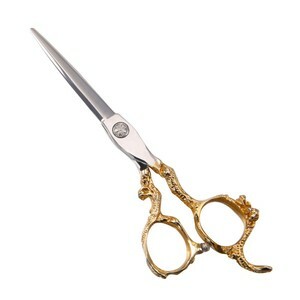 We make most of our scissors in both Right hand or Left hand model. We can also customize packing as per customer demand. Only happy customers can make our business better and stronger. 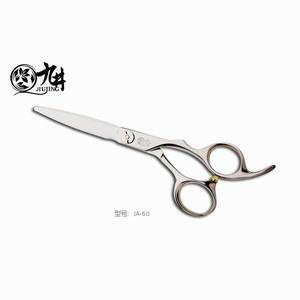 Pure J440 Premium stainless steel: Made of high quality stainless steel, enjoy sharp feeling. 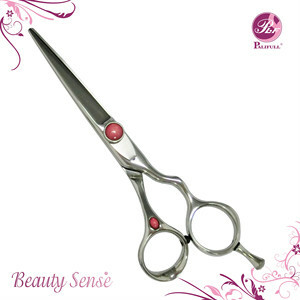 Adjustable screw: Silver tension and adjustment screw to easily tighten or loosen the shears. 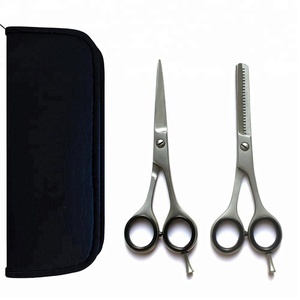 Comes in a FREE Protective Leather Zipper Case to preserve scissors and prevent accidents Under Customer Logo stamp on scissors and case. 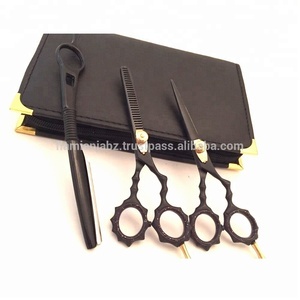 we are make high quality barber razor barber scissor barber barber belt with high quality and best price offer Q. We supply various kinds of styles and all of them are original and fashionable. Q. We have cooperated with the Jason hotel five-star hotels for a long-term partner. A. 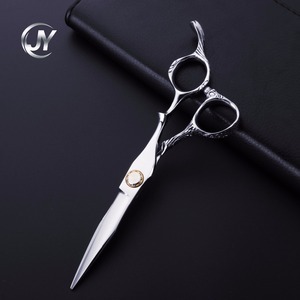 Best Hairdressing Barber Salon Scissors, Thinning Scissors, Thinning Razor Set 5.5"
Hand made Professional Hair Scissors forged with high quality Stainless Steel AISI 420 / J2, with 54-56 HRC. Razor edge convex hollow ground blades for improved edge retention. Comfortable classic design with removable finger rest and rubber finger inserts. 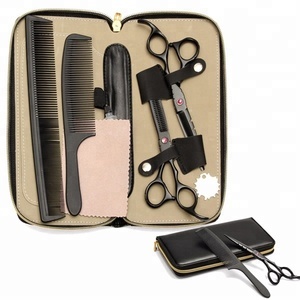 We do hairdressing and beauty components as well. We have our own development department and the factory. So you do not worry the price and the quality. 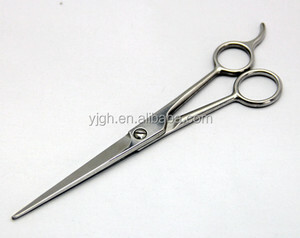 Alibaba.com offers 3,214 best barber scissors products. About 93% of these are scissors, 1% are pet cleaning & grooming products, and 1% are paper scissors. 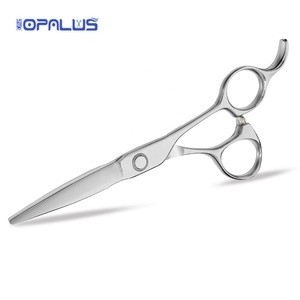 A wide variety of best barber scissors options are available to you, such as stainless steel, aluminium alloy, and titanium. You can also choose from no, yes. As well as from rubber, plastic, and ceramic. 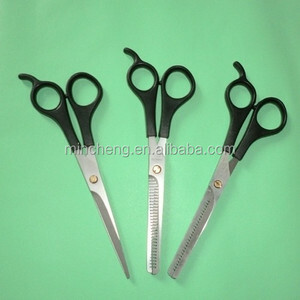 And whether best barber scissors is household scissors, kitchen scissors, or tailor scissors. 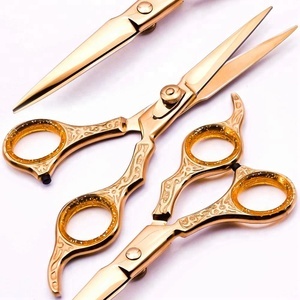 There are 3,246 best barber scissors suppliers, mainly located in Asia. 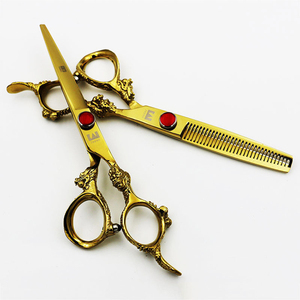 The top supplying countries are Pakistan, China (Mainland), and United Kingdom, which supply 75%, 23%, and 1% of best barber scissors respectively. 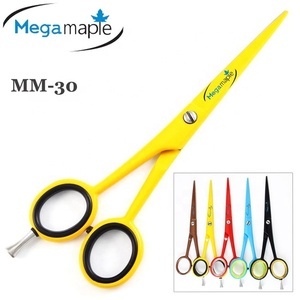 Best barber scissors products are most popular in Western Europe, North America, and Eastern Europe. You can ensure product safety by selecting from certified suppliers, including 384 with Other, 204 with ISO9001, and 64 with ISO13485 certification.